Her Majesty, a conventional and old-school work office. A big brown desk surrounded by scattered documents, notes and robust gadgets. Printer, a paper eater machine, still necessary for leaving physical evidence of your work. Scanner, a life-saver in the digital age communication and a magic wand for paper piles on your desk. Computer, a precious almighty data keeper. And you, glued to your chair, overwhelmed with your work. His Royal Highness, a tiny, but a powerful modern smartphone. A device that can embrace all necessities of a traditional office. All-in-one gadget that allows you to get off the chair. It would be nice to do your paperwork while sipping your creamy coffee in a favorite café with relaxing music in the background. It would be nice to do your work looking at the sea, listening to the waves and feeling the light, fresh breeze. It would be nice to organize your work in quiet and peace from your comfy couch at home, right? If so, learn how to transform your smartphone into a mobile office and get your work done anywhere. 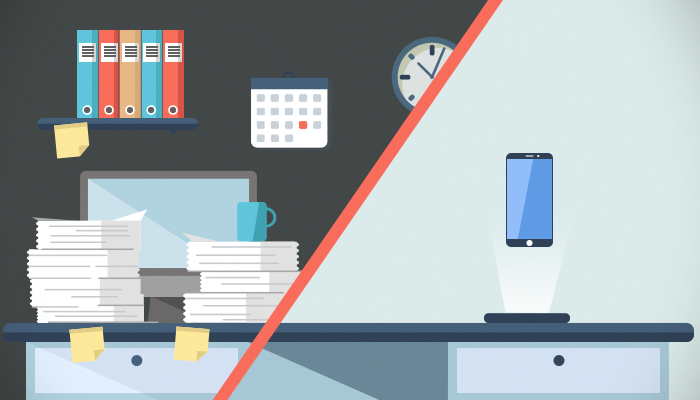 Simply click on the blue circles on the interactive infographic below and discover how you can replace common things from your office with effective mobile apps. Feel free to share this useful infographic and share the knowledge!